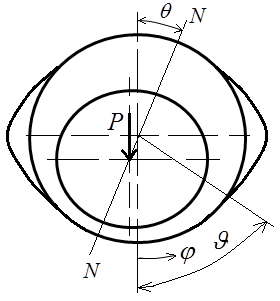 In sliding bearings contact of the elastic cylinder and a surface of a round cylindrical aperture in the elastic environment takes place, at a small difference of radiuses of the cylinder and a cylindrical aperture. Such contact of cylindrical bodies is called as internal. The sizes of domain of contact of surfaces are commensurable with radius of the cylinder and at calculation of deformations of bodies it is necessary to consider their real geometry. Calculation of elastic displacements of surfaces of contacting bodies at their internal contact represents an independent problem which can be generally solved, for example, a method of finite elements. In work  the general analytical decision of a flat problem of the theory of elasticity for a circular ring is resulted. The given decision can be used for the approached calculations of bearings of sliding. 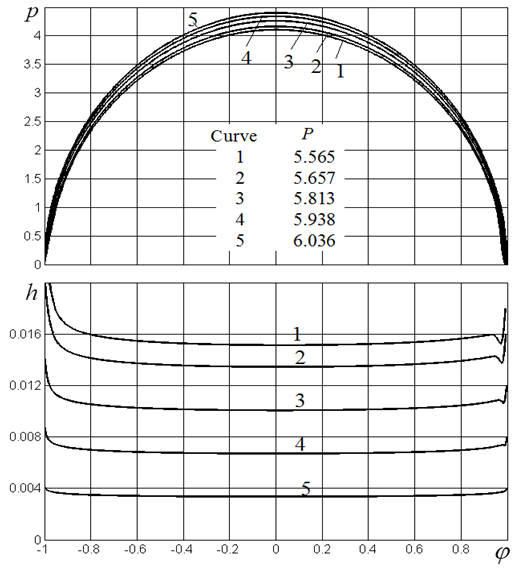 We use  results resulted in work for the analysis of solution of EHD problem at internal contact of cylindrical bodies in the most simple case of contact of the rigid cylinder and a surface of a round cylindrical aperture in the infinite elastic environment (fig. 7.1). The given problem is the approximate model of the sliding bearing which consists of steel shaft and the thick bush which is made of material with the small modulus of elasticity. Let the line of the centers (fig. 7.1) of an aperture and a shaft forms an angle with a line of action of loading. This angle is calculated in process of the problem solution. Through we designate an angle defining position of any cross-section section of a lubricant layer and counted from a line of action of loading clockwise. Let the direction of rotation of a shaft coincides with a direction of increase of an angle . We consider a case of the bearing with a partial spanning angle. In this case the co-ordinate of the beginning of a lubricant layer is defined by position of an entrance pocket from which lubricant moves under small pressure in a gap. Let the line of action of loading halves a spanning angle which is equal to . Then the co-ordinate of the beginning of a lubricant layer is equal . The co-ordinate of a point of breakage of a lubricant layer is unknown and is defined in the course of the problem solution. Thus the condition should be satisfied . where are Poisson’s ratio and Yung modulus of bearing material. is dimensional loading on unit of length of a shaft. Input parameters in the resulted system of the equations are following parameters: . After defining the values of these parameters and solving the system of the equations, it is possible to define the value of dimensionless loading . If the values of parameters are fixed the solution of the problem will depend on one input parameter that is parameter , i.e. , , etc. The first function defines dependence from , i.e. . Substituting this dependence in the second and third functions, we receive dependences , . On fig. 7.2 dependence of dimensionless load on dimensionless minimum thickness of a lubricant layer is presented. It is follow from these results that at zero thickness of a lubricant layer the load has finite value. This value can be found by the decision of a contact problem at dry contact of bodies. Namely, the decision of a problem on dry contact of bodies at spanning angle gives this value of load. Thus, at increase in load the thickness of a lubricant layer decreases and at certain load a mode when bodies are divided by a lubricant layer, passes in a mode at which surfaces adjoin on area of contact in the size . Fig. 7.2. 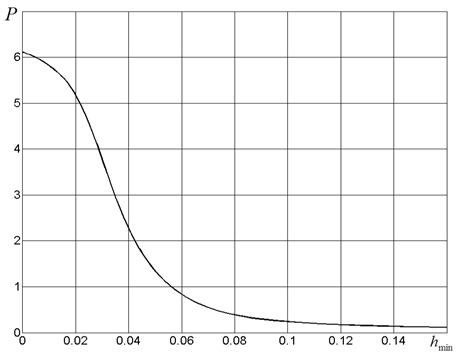 Dependence of the dimensionless load on a dimensionless minimum thickness of a lubricant layer. On fig. 7.3-7.6 dependences and are presented at various values of load . 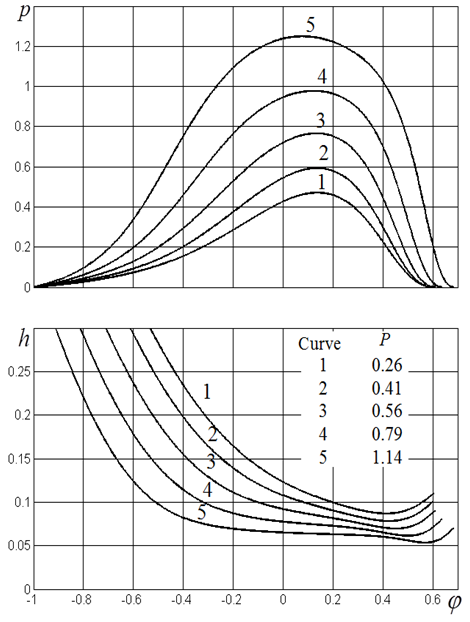 These dependences show, as function of pressure distribution and film thickness changes with growth of loading to its limiting value at which contact of surfaces on area is carried out. When load on the bearing is small (fig. 7.3), pressure distribution in a lubricant layer is close to the distribution which takes place if the deformations of the bearing are not taking into account. Namely, the pressure maximum is displaced to the right from a line of action of load and the pressure quickly goes down when angle is close to the value of . Thus the thickness of a lubricant layer quickly increases at removal from a point of its minimum. Let's notice that at small load the point of breakage of a lubricant layer is displaced to the left with loading growth. With growth of loading function gradually becomes, which it has in EHD contact. Namely, there is a contact area in which the thickness of a lubricant layer changes slightly (fig. 7.4, a curve 5). Besides, on an exit from zone of contact the graph of function has a concavity. Function also aspires to become, which it has in EHD contact. The pressure maximum is displaced to the left with loading growth. The outlet boundary point of area of a lubricant layer is displaced to the right. 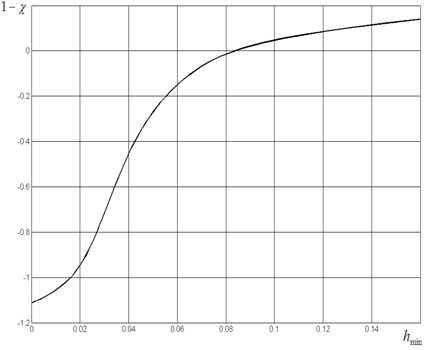 The graph of function becomes wider at high values . At the further increase in loading the area in which the thickness of a lubricant layer changes slightly, extends. Thus relative change of a thickness in this area decreases. 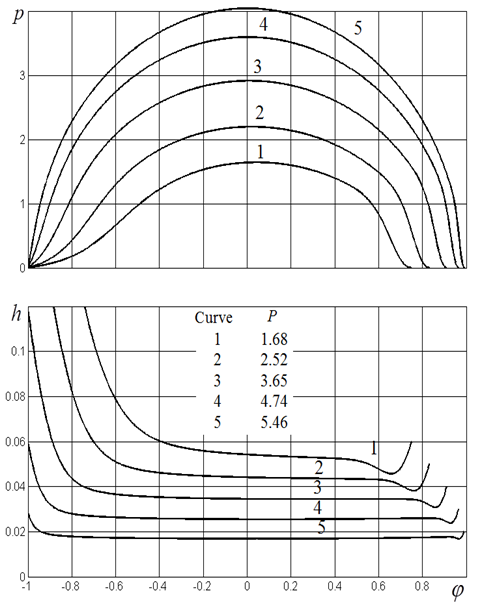 As a result there is a domain on which the thickness of a lubricant layer remains almost constant (curves 3, 4 and 5 on the bottom half fig. 7.5). After this domain of almost constant film thickness there is a domain where the film thickness fast falls, then growth and at last there is a breakage of a lubricant layer. At loading on the bearing, close to the limit at which direct contact of surfaces on area is carried out, the hollow on the graph on an exit from a gap gradually disappears. As a result the thickness becomes close to a constant in all area . Thus function is close to symmetric concerning an axis function. It also is close to function of distribution of pressure at dry contact of bodies and contact angle (fig. 7.6). minimum thickness of a lubricant layer is presented. If cylinder deformations were absent, value would equal to the minimum film thickness. In this case the curve on fig. 7.7 would represent itself a straight line which is starting with the beginning of system of co-ordinates and being bisector first квадранта. Taking into account cylinder deformations all changed essentially. At great values value is close to value . With reduction value decreases faster, than as the increasing of is caused not only by decreasing of , but also by shaft deformation. At value the value of difference is equal to zero. It means that at such value of eccentricity is equal to a radial gap. At the eccentricity is more than a radial gap. At such values of the minimum film thickness the positive gap is formed only at the expense of deformations. At a maximum load when surfaces of bodies adjoin on area , the value of eccentricity is equal to . 1. M.A. Galakhov, P.P. Usov. 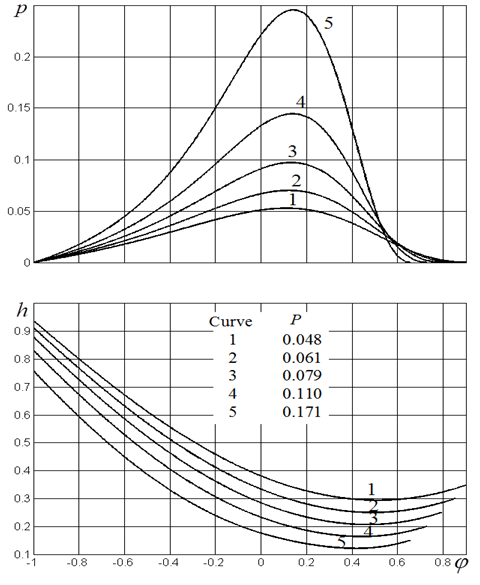 Differential and Integral Equations of Mathematical Theory of Friction. Moscow, 1990.